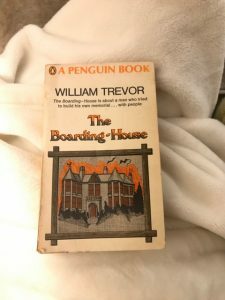 This entry was posted in Irish literature and tagged Penguin Books, The Boarding-House, William Trevor by Simon Lavery. Bookmark the permalink. I read this ages ago when I was having my William Trevor phase and read everything I could find in the library. I loved it. I have always liked ‘hotel novels’ – of which this is a variation- because they enable such interesting characterisation: people brought together without anything in common, just because they’re buying accommodation from someone whose only interest in them is profit. Jacqui is right to favour these novels as a sub- genre. I read many of his stories long ago and remember them as being very different from this – more Chekhovian. Must go to my Complete Stories- huge 2-vol box set! 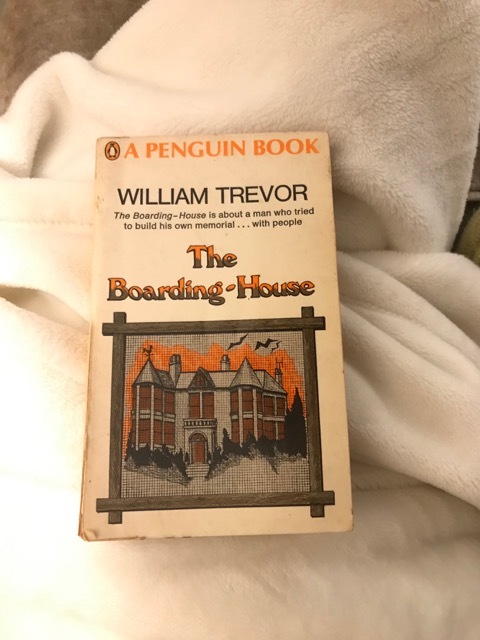 I think Jacqui is the one for that; it was her piece on this novel that gave me the impetus to take it down from the shelf, and in her post she says she has a thing for boarding-house/hotel fiction. There is quite a backlist. Would be useful if someone would undertake the task – if it’s not been done already. Trevor is one of those writers I’ve long meant to read – and this one sounds fascinating, though I still don’t quite know what I’d make of him. Will have to try! And my friend Terri Mulholland did her DPhil on the boarding house novel – I think she published a book off the back of it, so lots to discover there! Ah, the boarding house! By chance, I happened to watch an absolutely amazing film last night from 1984 called “A Soldier’s Story.” Similar, in that it featured a group of people thrown together, with a malign authority figure manipulating their lives. It is set in a 1944, WWII era African American soldiers’ barracks in the segregated Deep South, as they await shipping out to Germany. The characterization was absolutely incredible. I was amazed that at the time, it was so tepidly reviewed. Once again, Siskel and Ebert, the U.S. film critics, and I are in total disagreement. Howard Rollins, who sadly passed away at 46, excelled as a rare, African-American officer, a JAG captain dispatched from Washington, DC to investigate a murder in Jim Crow Louisiana. Complex and gripping, with an incendiary early performance by a young Denzel Washington. Went a bit far afield, but the film and this novel really resonate with me. I love work that is dark and bracing. Don’t think I’d heard of this film – sounds good.